Click on image to play video (high speed connection advised). The precautionary decision to bail from my hideout earlier yesterday afternoon was either been a well-judged one that kept me from premature capture by the authorities or a paranoid one made completely out of proportion to the real likelihood of being caught. I will never know the truth of course, but the events of the last two days since have convinced me that it was definitely the right thing to do. Very often in such situations one's gut makes the right decision. 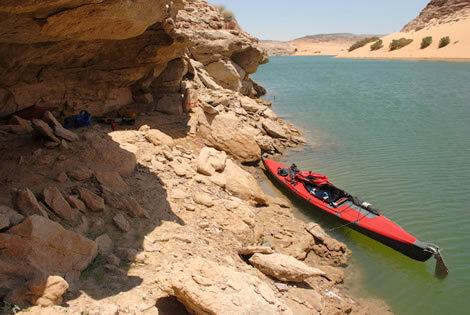 By 8.30 pm the light had faded sufficiently to allow continue paddling northward to my goal of Abu Simbel. It is here that a sealed road begins again all the way through to Europe. If I could just get to Abu Simbel, I was one [big] step closer to completing the circumnavigation. But if I was caught beforehand, even just a few hundred yards before making landfall, the only choice would be to backtrack thousands of miles to Mumbai in India (where Sher and I had started pedaling across the Arabian Sea in Moksha back in late February) and pursue an entirely different route to Europe via Pakistan and Iran: thousands of extra miles and thousands of wasted dollars - all over a piddly little bit of water. But unfortunately a crucial piddly little bit of water to complete by human powered means in order to ensure a legitimate circumnavigation. So much rested on this final night. It was about an hour later, as I was plugging forward motivated by Twinkies and Green Day, that I felt something start crawling up my left leg. I knew instantly what it was: the idea of a large, no doubt poisonous, arachnid slowly ambulating its way over my skin is something I have had terrible nightmares about ever since I was a child. I'm not wild about snakes, but I can deal with them. And I don't mind scorpions or most other creepy crawlies. But when it comes to the 8-legged cousins I just want to run away screaming like a hair-dresser - ask my mother. So imagine my utter horror at not only having one of these things crawling up my leg, but there being very little I could do about it because of the kayak skirt (a waterproof shield that stops waves from sloshing into the cockpit) preventing me from flicking it instantly away. I tried to push it off with my knees but this turned out to be a bad idea - the wretched thing promptly bit me! I couldn't take it anymore. I dropped the paddle in the water (a potentially disastrous thing to do if I were to lose it), ripped away the velcro seal of the skirt as fast as I could, and managed to grab the thing and throw it overboard before it helped itself to another mouthful. Fortunately I don't think it actually injected any venom as the pain remained local to below the knee and started to wear off after only 30 or so minutes. By 4 am I reached the last GPS waypoint on the east side of the lake before crossing over to Abu Simbel; the glittering lights of the harbour by now clearly visible directly to the north (see video above). Another hour of paddling and the nose of the boat finally touched the shoreline of Abu Simbel. But there was no time to lose: even at 5.15 a.m. the faintest suggestion of milky grey light was fading in from the east. People would start getting up and about from anytime now onwards and the chances of being seen were increasing by the minute. Until just a few hours previously I had been wrestling with a decision to either end the voyage in Abu Simbel and try making it to Aswan to clear Egyptian immigration, or paddle back to Wadi Halfa in Sudan, undetected of course, and take the ferry to Aswan on the 20th. The advantage of the latter was that the Sudanese authorities would give me an exit stamp in my passport (even if they didn't believe my story of paddling around in circles outside Wadi Halfa for 5-days), which would mean a clean and hassle-free entry into Egypt. In the former scenario I would present myself to the immigration authorities in Aswan (287 kms to the north), assuming I was even able to get there without having to show my passport at the police checkpoints along the way, and hope they would overlook the fact I had no exit stamp from Sudan. Awkward questions would inevitably follow, and possible deportation back to Sudan: more time, more money, and still the dreadful prospect of having to backtrack to India. I decided therefore to take plan B and keep things clean. However in order to catch the ferry in time I would need to paddle during daylight hours as well as the night. Now that I had reached Abu Simbel I considered this to be an acceptable risk. Even if I was caught now I had achieved the primary goal of reaching the sealed road. So after a few hours rest in a perfect hideaway cave in the convoluted folds of an inlet system just a mile south of town (see video above) I began the return journey towards the border along the west side of the lake. By 4 pm I was making good progress with a light breeze to the boat's starboard stern quarter. But, just as I was thinking how well things were turning out, I heard the sound of a motorboat fire into action from an island about a mile to the north. The boat seemed to be heading straight for my position and I could make out three people on board. My luck was about to change, and deep down I knew it wasn't going to be for the better. As the craft drew closer I could make out that it was a fishing boat, surely not something that the authorities would use? But you never know. The thing that put me on edge however was the island they had come from: there were two semi-permanent looking buildings on the south facing slope. All the other shelters I'd seen on the lake (mainly south of the border in daylight) had been make-shift structures made from sticks and palm fronds. I wondered if these were perhaps fishermen who were also employed as observers by the border forces? As the boat pulled alongside a short stubby man in a dirty red t-shirt began flailing his arms around like a windmill, shouting in arabic and pointing to the south. I could make out the word for 'kabir', meaning big, and a word that sounded coincidentally like 'fish'. Was he saying there was a big fish waiting to swallow me up if I continued? Or perhaps he meant crocodile? I offered the arabic translation for crocodile and this seemed to strike a cord with him. "Yes, Yes, timsah kabir, timsah kabir!!!". More excited gesticulating. A very unlikely story I reckoned, but perhaps they think I'm a dumb tourist completely lost and they're doing me a favour by trying to stop me? Then he mentioned the word 'police' in his wild jabberings, crossing his forehands in the sign of someone being arrested, then jabbing a fat sausage-like finger towards the south. Does he know something I don't? Perhaps there's a patrol boat waiting around the corner that he's trying to warn me about? Or, as my original instinct suggested, it's all an elaborate ploy to turn me in? All of these possibilities whirled around in my head in confusion as I desperately tried to decipher what was really going on. One of the three then took a hold of the front of my boat and they began trying to tow me back to the island. At this point I delved into my camera bag (the guy in the red shirt recoiled initially as I thought I was pulling a gun! ), and turned the video camera on them, just so they knew that the events were being recorded for possible future accountability if things turned sour. They subsequently freed my boat and I decided to err on the side of caution by following them to land, give it half an hour to try and pick up more clues as the reality of the situation, then head off. On the island I was offered tea in one of the huts while two of them took a boat out fishing. Or at least that's what the guys who stayed behind would have me believe. What they were really doing was going out into the middle of the lake where there was mobile phone reception so they could call the security forces in Abu Simbel. Not realizing this (until it was too late) I decided to hang out for 45 minutes until around 6 pm, then paddle off and if necessary just poodle around the surrounding area until it was dark enough to continue south. This way even if there was a patrol boat waiting down the coast I could slip past it undetected. But I didn't want to spend any more time here than was needed to gather information. There was a definite uneasy energy in the air. Plus their fishing camp was littered with refuse and the smell quite overbearing. Time slowly ticked by and barely a word was uttered even between themselves, let alone to me. Something was definitely not right. By a quarter to six I had had enough and stood up to head down to my kayak. At once the rest of the gang stood up with me and followed me out of the shelter. I told them I was leaving (not that they understood a word) and thanked them for the tea and the incredible hospitality they'd displayed (?!?). As we neared the water's edge I could make out the faint sound of an outboard motor approaching from the north. I quickly picked up my paddle and continued walking faster now towards the kayak. Suddenly I felt two sets of hands on either of my upper arms. I shrugged them off in irritation and continued walking. The hands came in again, this time with a much firmer grip. When I tried pulling away again a struggled ensued and the whole mob pounced on me and flattened me on the ground with a pair of knees pinning me in the small of the back just below my kidneys. 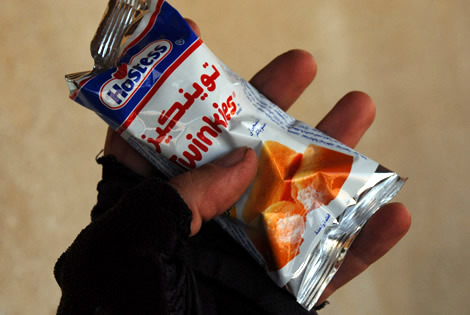 I knew at this point that I had been betrayed and the sound of the motor was the security forces coming to arrest me. I should have listened to my original intuition when I first saw them coming towards me on the lake and just carried on. Although ironically it would later transpire that they were actually doing me a favour by not having to paddle all the way back to Sudan (see next report). A short while later I was hauled to my feet and a smallish white boat (perhaps 4 metres) with three plains clothes army personnel came to a halt beside me on the beach. The commanding officer, a pock-mark faced man of around 35 years old masked behind aviator-style sunglasses, had his firearm drawn and ready to use. Quick verbal exchanges between the fishermen and army guys (who turned out to be with Army Intelligence) followed, the former no doubt over-dramatizing their side of the story to try and increase the value of their reward. I just went along with the whole thing as at this point I had little to gain by either resisting arrest or being difficult. The main thing was to impress upon the CO that I was just a dumb tourist who had wandered astray and not a covert operative working for a foreign government - something that would only be clarified 36 hours later at their detention centre in Abu Simbel. 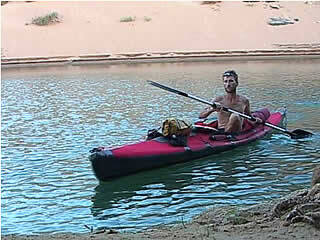 With the kayak loaded into the launch we took off back towards Abu Simbel with the light now fading past. The fishermen looked so happy with themselves I felt I should say or do something to wipe the smiles from their faces. But I decided to kept my mouth shut for a change. I didn't want my new captors thinking that I knew I was actually in the wrong. Plus I actually felt a little sorry for these guys living all the way out here in this barren wilderness on their polluted island covered in their own rubbish. Who knows, perhaps they were a microcosmic example of things to come for the entire human species if we don't curb the rapacious pace at which we are using up the planet's resources? Guinea pigs in a field experiment to determine the likely outcome of life on earth?